"Many of these youth are facing significant issues: domestic violence, substance abuse in the family, foster care, parents who've passed away and more." 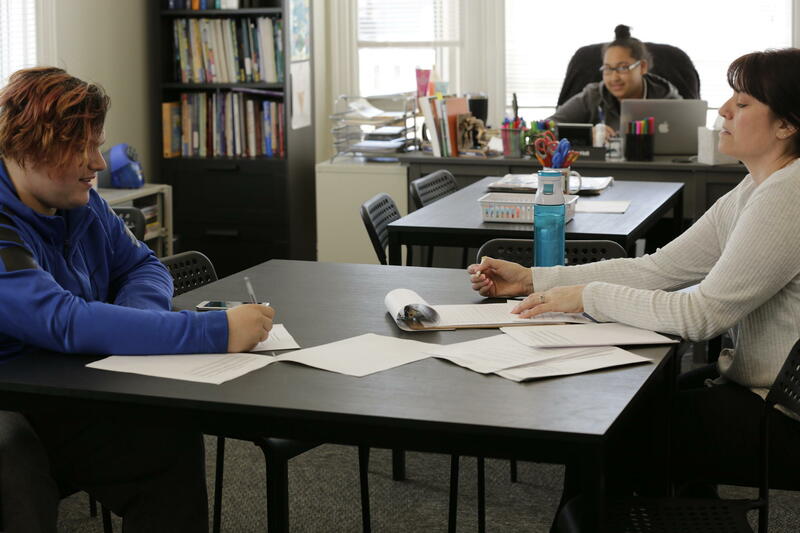 This week, Maine Public Radio News will air a weeklong series “Finding A Way,” reporting on the students who are being affected and the schools and organizations that are trying to help them, even as resources are scarce. Maine Public reporter Robbie Feinberg took the lead on the series, and he spoke with Morning Edition host Irwin Gratz about why this is such an important issue. Feinberg: This project really began when there was some discussion a few months ago about funding for education for homeless students in the state. As I dug into that, I started to look at the numbers and see that Maine was seeing this big growth in the number of students who were homeless and displaced — something like 30 percent more over the past few years. So we’re clearly seeing this trend of more young people who need more supports and basic needs, like food or housing. Yet because Maine is so rural, a lot of these needs are really hidden and resources are limited. So our goal was to look at why this is happening and some of the biggest issues that these kids — and the state — are facing. Gratz: So what are some of the stories we’re going to hear about? We’re going to hear some of these students’ stories, which I don’t think you often hear. Many of these youth are facing significant issues: domestic violence, substance abuse in the family, foster care, parents who’ve passed away and more. All of that obviously has a big effect on what these kids are even able to learn in school, which we’ll hear about. But what’s amazing when talking with many of these youth is how many are really motivated to finish school and keep going. It’s just that when you’re facing a million barriers, it can be close to impossible to overcome. In general, how are we doing? Are these kids getting what they need? That’s a major takeaway across a lot of these stories. A lot of the groups on the front lines here — case managers, shelters, schools, there are all these people who are trying really hard to find and serve a lot of these youth and support them. In a lot of cases, they are getting them the help they need. But over the past decade, we’ve seen some of these services get consolidated. Some youth shelters and programs have actually shut down for financial reasons, which is making it more difficult for some youth to access some services. So we’ll be reporting on how this affects students, with a particular focus on rural Maine, which has a lot more challenges, like transportation and fewer services in general. "Because Maine is so rural, a lot of these needs are really hidden." And then you’ve also got schools, which play a big role in identifying these students and making sure they get an education. Right now, there’s a real variety and mix of what schools are doing if you go district by district. Some districts are doing a lot for kids and have staff members whose jobs are largely dedicated to helping these youth and getting them in a safe environment. But then you have other places that really haven’t necessarily focused on this work in the past and have only recently begun doing more. You also have the funding side: a lot of districts are investing in resources like social workers and are paying a lot more for transportation to support these kids and make sure they’re getting to school and staying connected to their communities. Those in the field say they’re going to provide these services to help students, but it can also stretch resources really thin. So even though these schools or social service agencies are trying to do what they can for these young people, they often don’t have the bandwidth to do more, like they might want, particularly in rural areas. Are we seeing many solutions at this point? Even with these limits, there’s some really exciting work going on. There’s potential for some programs for youth in more rural areas to find temporary housing within their local communities, which advocates say is a big challenge. I also visited a school program in southern Maine with a lot of students who have gone through a fair amount of trauma, including many who have dealt with homelessness. Through some really exciting practices that we’ll tell you about, these kids are actually going to school and graduating. That’s exciting to see.